You don’t have to really love seafood to get the best out of the Streah Malt Tasters annual pilgrimage to Robe in March each year, but it sure helps. It’s an annual celebration of things malty, vinous, gamey and of course the exquisite local bounty of the sea that locals call crayfish but is really a lobster (southern rock lobster (jasus edwardii) and snapper (chrysophrys auratus). Robe is a beautiful little fishing port and resort town on the Limestone Coast three and a half hour’s drive south east from Adelaide. It’s a genuinely lovely spot, being protected from the Great Southern Ocean, by a spit of coast that sticks out due west and allows for a sheltered harbour on the leeward/northern side. Of course when the wind blows from the west and not the south, the harbour and the foreshore cop a beating, but there is a marina for all the boaties and fishermen that is protected by a breakwater and channel from the open sea. Robe was an important port in the early days of European settlement as it provided safe harbour for sailing ships rounding the Cape of Good Hope and picking up the Roaring Forties making for Melbourne, but needing to hold up before braving the shallow and turbulent Bass Strait. Robe is also, fortunately for history and architecture buffs, pretty well preserved with lots of buildings from the 1850’s surviving until today which is pretty rare in the State of South Australia where the built environment only stretches back to 1836. One of those early buildings, the lovely and historic Caledonian Inn built in 1859 by Peter McQueen (and where more aptly named could one possibly hold a scotch malt whisky dinner) also reflects that much of the State’s early settlers were from the UK and Scotland in particular, the Scots being both great seafarers and looking for emigration opportunities resulting from the clearances. You’re more likely to run into people with first names like Dougal and Fergus in this part of Australia than just about anywhere else. Lunch was at Victoria Cottage, another relic of the 19th Century, but nicely renovated with a lovely rear deck with canopy and barbeque. The lobster and snapper were served in a couple of ways. The lobster is traditionally cooked by boiling in large coppers and then served cold, usually with freshly ground black pepper and lemon juice and sometimes with white vinegar and mayonnaise. The hosts added a chili, garlic and thai fish sauce variation to add a little bit of spice and it worked well with both versions. I’d never had fresh crayfish barbequed before and it has a totally different texture – much more like crab or fish such as flathead. Also the barbeque imparts a smoky character that adds another dimension. The snapper was served in both the traditional baked version (whole gutted fish [about 2kgs], stuffed with fresh herbs and sliced lemon and garnished with rings of lemon, wrapped in alfoil and baked in an oven) and grilled fillets on the BBQ. Both versions were delicious and were ample evidence of why Snapper is a prized eating fish in Australia. Pale white wine in colour, shy and subdued nose to start with a little spun sugar and toffee syrup, then opens up with vanilla pod, a hint of solvent, cream, linen, pureed fruit (nashi pears) and baked apple pie, fresh pear juice, sweet pastry dough and laundry powder (Lux flaxes). Freshly laundered linen; sweet, creamy and freshly fruity. Palate is slightly warm and continuing with the fresh fruit theme, whipped cream, some plaster and chalk with more fresh pears and creme fraiche. Finish is warming and creamy, smooth and slightly short, with some bitter metal. Comments: Probably a mix of refill sherry and first fill bourbon wood, polished, gentle and balanced with a little hint of Speyside metal and a tad short – a poire william like malt. Pretty classy and nicely balanced but a tad on the bland side. Eminently drinkable; would work as either aperitif or digestif; I’d love to pair it with traditional baked apple pie or nashi pears and creme fraiche. It reminded me most of the Family Silver, but with a little more impact and interest. Dark tawny autumn leaf brown colour with amber highlights, big oloroso up front, classic old style European oak sherry nose, (raisins, brandy pudding, brandy soaked plums and fruitcake). With a little water, more sponge cake (Dundee cake), milk chocolate, baked bananas, sterile bandages, mustard plaster, bitter cress. Undiluted palate is dominated by alcohol along with medicinal bandages with a hint of old fireplaces and cold ashes along with fruitcake and sour cherries. With water, the plum pudding, metal, wood bitters and chocolate emerge. Finish is bitey and slightly medicinal (iodine) long and warming, initially sweet then dry with powdered cocoa and some wood bitters. Comments: Nose is excellent with and without water but the palate really needs water; big and impressive whisky, but maybe a little too aggressive on the palate to score higher. Port red colour, with tawny brown highlights. Apart from an alcohol bite, the nose has blue vein cheese, sour cherries, toffee, Caramac confectionery and with a little water reveals balsamic, red wine vinegar and cranberry jam. It gets less pleasant with a strange perfume: overtones of slightly off mead or fermented honey gone stale. There’s also a slight disconnect between the wood and the malt that gets more obvious over time as the sour cherries and the sweaty honey start to disengage. Comments: I found sulphur in this one and then I checked my records and found that I had tasted this exact bottling before and found more obvious sulphur then causing me to score it lower. I didn’t notice the sulphur as much this time, but it was still there. Adelphi admits these bottlings were controversial and I can guess why. Mahogany red in colour with autumn brown highlights. Nose has lots of mint (spearmint, mint toffee) and pyrethrum over polished oak, dried leaves, aerobically composted dry forest floor, fruitcake, berry jam & cream, mint leaves and cream; lovely and sophisticated. Palate has cherries, sour plums, brandied fruit, toffee, sterile bandages and wood bitters (angostura). Finish has sour fruit, bitters and over-extracted oak. The bitterness hangs around. Comments: Excellent nose which raised expectations that this would be special and yet the overall package was diminished and slightly spoiled by over-extracted oak especially in the finish. The tannins got a little too insistent. There shouldn’t be abiding (even if faint) bitterness in a thirty year old malt. Colour is a limpid amber/mahogany. The exceptionally clean nose has Muscat macerated fruit, pine needles, sandalwood, pineapple, meringue and cognac like citrus notes. Palate is smooth, fruity and reminiscent of orange liqueur. The finish has orange bitters and orange zest; long, pleasantly warming and syrupy, but never cloying. Comments: Beautifully balanced and integrated – close to a great cognac but better (sorry Serge). The wood compliments and supports the malt but never takes over. This is the fifth time I’ve tasted this whisky since 1992 and I’ve never scored it less than 90. It was the standout malt in this company. 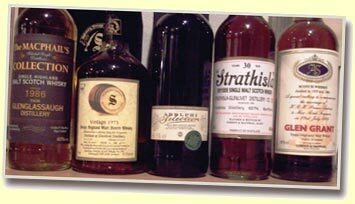 I’ve been to four of the Streah’s Robe bashes, having only missed one in 2005, when we’d organized the MWSoA’s gold medal round of whisky judging on the same weekend. Based on the four that I’ve attended I wouldn’t miss it for quids.